Eclipse season in nigh… though most of us won’t notice the start this week. The second eclipse season for 2018 commences with the arrival of New Moon and Brown Lunation number 1182 at 3:01 Universal Time on (triskaidekaphobics take note) Friday July 13th, 2018. This eclipse is a shallow partial, just skimming the southern hemisphere of the Earth between the Australian and Antarctic continents. We doubt many eclipse chasers will make the pilgrimage to Tasmania to see such a slim partial, though we know of at least one, veteran eclipse chaser Jay Pasachoff who has expressed intent on the Yahoo! Solar Eclipse Message List (SEML) message board to head southward this week. Tasmania gets the best view, with a maximum 9.5% obscuration of Sol as seen from the capital Hobart around 3:25 UT. The upper limit of the eclipse path just skims the southern coast of Australia across the Great Australian Bight and the southern Indian Ocean, and nicks the very southern tip of the south island of New Zealand and Steward Island at 3:48 UT with a barely discernible 1% eclipse before the lunar penumbra departs the Earth. If skies are clear, the very best view just might come along the coast of Antarctica, as the 33% eclipsed Sun rolls along the northern horizon. Perhaps a few lone penguins will notice, if they bother to look at the Sun filtered through the murk of the atmosphere along the horizon. France does have one permanently occupied research station in Antarctica named Dumont D’urville along the coast that will see a 30% eclipsed Sun on the horizon right around 3:00-3:15 UT. 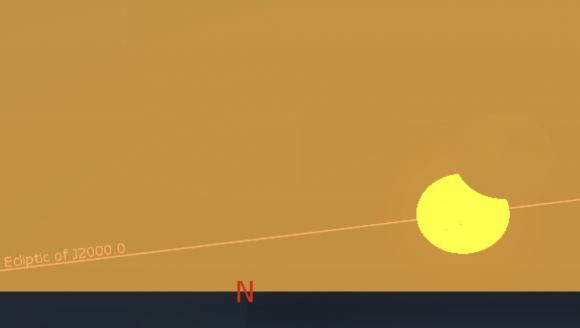 We say that this heralds the start of eclipse season, as the ascending node where the Moon’s orbit intersects the ecliptic plane is very near the current position of the Sun. In fact, node crossing occurs at 18:50 UT on July 13th, just 24 hours after New Moon. Eclipses always occur in at least pairs, and the Full Moon two weeks later is close enough to the descending node for a nearly central total lunar eclipse on July 27th (more on that in a bit). This season, however, is special, with a third eclipse ending the cycle on August 11th, 2018, this time gracing the Arctic pole of the Earth along with Scandinavia and Russia. We’re already seeing some hype surrounding this event as a “Supermoon eclipse,” as the Moon reaches perigee 5 hours 27 minutes past maximum eclipse. Note that this also sets us up for a Minimoon total lunar eclipse two weeks later, as the Moon is near apogee on July 27th. The Moon’s orbit is tilted 5.145 degrees relative to the plane of the ecliptic, and the nodes make one full revolution around the Earth relative to the equinoctial points once every 18.6 years in what’s known as the precession of the line of apsides. A partial solar eclipse means that all safety precautions must be taken throughout all phases of the eclipse. 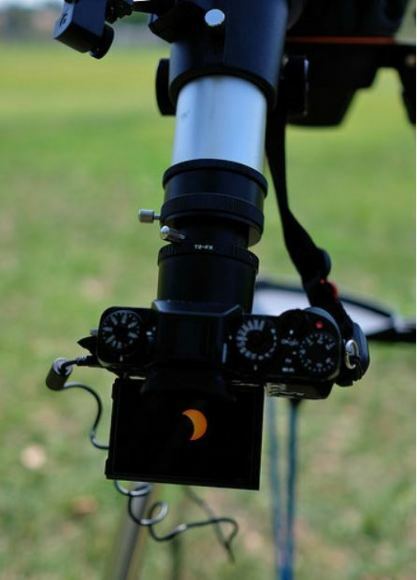 This means using approved solar filters that fit snugly over the aperture of a telescope, and solar glasses with the approved ISO 12312-2 rating for solar viewing. We built a safe binocular filter out of a set of spare eclipse safety glasses for the August 21st, 2017 total solar eclipse last year. Unfortunately as of writing this, the disk of Sol is blank in terms of Earthward facing sunspots, and may be so on eclipse day. We’re currently headed towards a profound solar minimum and the Sun has already been spotless for more than half of 2018 thus far. Don’t own a solar filter, safety glasses or a telescope? You can always use our tried and true method of projecting the eclipse using a spaghetti strainer. It’s all in the gamma. This eclipse is partial only, because the dark inner shadow or umbra misses the Earth by 35.4% of the radius of the planet or about 1,400 miles. The gamma for an eclipse states how many Earth radii an eclipse deviates from central (where the Moon’s umbra is aimed straight at the center of the Earth) and Friday’s eclipse has a gamma value of 1.3541. Friday’s eclipse is part of an older saros series, member 69 of 71 eclipses for saros series 117. This saros started waaaaaay back on June 24th, 792 AD, and produced its last total solar eclipse on May 9th, 1910. This was also the last total solar eclipse for Tasmania until June 25th, 2131. This series only has two more eclipses to go, with its last event occurring briefly over the Antarctic on August 3rd, 2054. Perhaps, Friday’s event will be the very last one witnessed by human eyes for saros 117. Mr. E. Carns Driffield’s drawing of Total Solar Eclipse of the Sun on 9 May 1910. Image credit: Joy Olney. This also sets us up for the best of the three eclipses this season, the total lunar eclipse at the end of the month on July 27th. This eclipse will be widely visible across Africa, Europe, Asia and Australia—only the Americas miss out. The International Space Station also threads its way through the outer shadow of the Moon towards the end of the event Friday at ~3:50 UT. ESA’s solar observing Proba-2 spacecraft might just get a very brief view as well from its vantage point in low Earth orbit, around 3:09 UT. Proba-2’s brief view of the eclipse on July 13th at 3:08 UT. Credit: Starry Night. And although most of us miss out on Friday’s eclipse, you can still try and spot the slender crescent Moon on the evening of Friday, July 13th. The U.S. East Coast is particularly well placed to try and spy the slim Moon low to the west, only 22 hours after New. After that, the Moon tours all of the naked eye planets, passing Mercury and Venus this weekend and passing Jupiter, Saturn and Mars en route to the July 27th total lunar eclipse. Will anyone webcast the eclipse live? So far, no webcasts (not even from the venerable Slooh site) have surfaced… if anyone else is planning on featuring the July 13th partial solar eclipse, let us know! It’s the biggest question when it comes to solar eclipses. When’s the next total? Well, just under a year from now, the next total solar eclipse crosses Chile and Argentina on July 2nd, 2019. Note that this event crosses over several major astronomical observatories at La Silla. 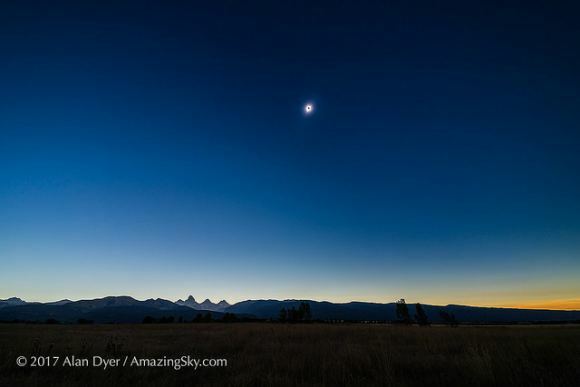 How many newly minted eclipse chasers fresh off last year’s Great American Eclipse experience can’t wait until totality next visits the United States on April 8th , 2024 and plan to head to South America next summer? Partial eclipse rising over the Vehicle Assembly Building at the Kennedy Space Center on the morning of November 3rd, 2013. Image credit: Dave Dickinson. A partial eclipse may not inspire many eclipse chasers to hop on a plane, but we can still marvel at the celestial ticks of a clockwork Universe carry on, right on schedule. -Got the eclipse chasing bug? Read all about eclipse chasing, observing and photography in our new book, the Universe Today Guide to Viewing the Cosmos: Everything You Need to know to Become and Amateur Astronomer out on October 23rd. It’s long been predicted that a solar eclipse would cause a bow wave in Earth’s ionosphere. The August 2017 eclipse—called the “Great American Eclipse” because it crossed the continental US— gave scientists a chance to test that prediction. Scientists at MIT’s Haystack Observatory used more than 2,000 GNSS (Global Navigation Satellite System) receivers across the continental US to observe this type of bow wave for the first time. The Great American Eclipse took 90 minutes to cross the US, with totality lasting only a few minutes at any location. As the Moon’s shadow moved across the US at supersonic speeds, it created a rapid temperature drop. After moving on, the temperature rose again. This rapid heating and cooling is what caused the ionospheric bow wave. The bow wave itself is made up of fluctuations in the electron content of the ionosphere. The GNSS receivers collect very accurate data on the TEC (Total Electron Content) of the ionosphere. This animation shows the bow wave of electron content moving across the US. The ionosphere stretches from about 50 km to 1000 km in altitude during the day. It swells as radiation from the Sun reaches Earth, and subsides at night. Its size is always fluctuating during the day. It’s called the ionosphere because it’s the region where charged particles created by solar radiation reside. The ionosphere is also where auroras occur. But more importantly, it’s where radio waves propagate. The ionosphere plays an important role in the modern world. It allows radio waves to travel over the horizon, and also affects satellite communications. This image shows some of the complex ways our communications systems interact with the ionosphere. There’s a lot going on in the ionosphere. There are different types of waves and disturbances besides the bow wave. A better understanding of the ionosphere is important in our modern world, and the August eclipse gave scientists a chance not only to observe the bow wave, but also to study the ionosphere in greater detail. The GNSS data used to observe the bow wave was key in another study as well. This one was also published in the journal Geophysical Research Letters, and was led by Anthea Coster of the Haystack Observatory. The data from the network of GNSS was used to detect the Total Electron Content (TEC) and the differential TEC. They then analyzed that data for a couple things during the passage of the eclipse: the latitudinal and longitudinal response of the TEC, and the presence of any Travelling Ionospheric Disturbances (TID) to the TEC. Predictions showed a 35% reduction in TEC, but the team was surprised to find a reduction of up to 60%. They were also surprised to find structures of increased TEC over the Rocky Mountains, though that was never predicted. These structures are probably linked to atmospheric waves created in the lower atmosphere by the Rocky Mountains during the solar eclipse, but their exact nature needs to be investigated. This image of GNSS data shows the positive Travelling Ionospheric Disturbance (TID) structure in the center of the primary TEC depleted region. The triangles mark cities in or near the Rocky Mountains. Image: Coster et. al. “… a giant active celestial experiment provided by the sun and moon.” – Phil Erickson, assistant director at Haystack Observatory. The Great American Eclipse has come and gone, but the detailed data gathered during that 90 minute “celestial experiment” will be examined by scientists for some time. 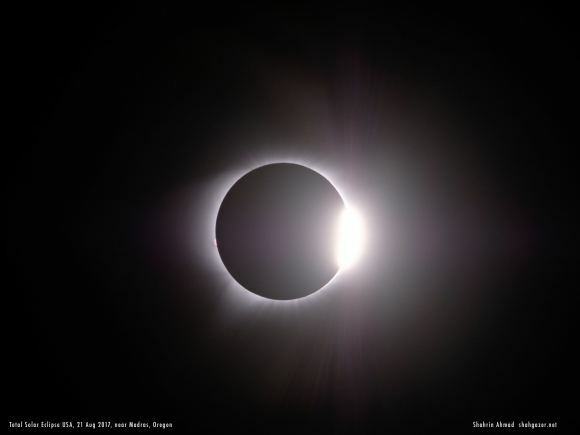 A brilliant diamond ring punctuates totality. Image credit and copyright: Shahrin Ahmad. They came, they saw, they battled clouds, traffic and strange charger adapters in a strange land. Yesterday, millions stood in awe as the shadow of the Moon rolled over the contiguous United States for the first time in a century. If you’re like us, your social media feed is now brimming with amazing images of yesterday’s total solar eclipse. Already, we’ve seen some amazing reader images at Universe Today, with more to come. As a special look at a unique event, we’ve collected reader testimonies from every state along the path of totality of just what the eclipse was like. We drove from Dalles at 3 AM. Nearing the observation spot, we got a flat tire! It was 5:30 AM, and no phone line! I sent a text to the land owner and somehow it reached him and we managed to be there by 6:30 AM. We observed from a secluded spot about 30 miles from Madras, with a 2 minutes and 2 seconds of totality. The sky was really clear during sunrise, but as totality approached we got some thin clouds hovering in the east. Luckily, it was thin enough to not spoil anything. The corona was incredibly beautiful with longer (streamers) jutting out at the 4 and 8 o’clock position. The first and second diamond ring were spectacular with the eye, probably with the help with the thin clouds. We calculated about 7 degree drop in temperature. The shadow was enormous, engulfing Mt Hood from the west and flew past above us towards and towards the Sun. Mesmerizing! 2 minutes simply was not enough, since this is probably my best view of a total solar eclipse so far! The bright star Regulus, tangled up in the solar corona. Image credit and copyright: Shahrin Ahmad. How to describe such a magnificent spectacle in a “brief paragraph”? Our group from Edmonton observed totality under clear skies near Birch Creek, Idaho. After the Moon’s silhouette inexorably progressed & gradually swallowed up an impressive line of sunspots, the pace of dynamic events picked up dramatically in the minutes surrounding totality. The temperature dropped noticeably. Light faded & became “flat” while shadows became better defined & lost their fuzzy edges (penumbrae). The Moon’s onrushing shadow became visible on the mountains to our west, while rapidly-moving shadow bands squiggled on the ground around us. The sky took on an eerie indigo hue as the last vestiges of direct sunlight were obscured. A new & temporary centrepiece emerged in the sky: the black circle of the lunar night side highlighted by a spectacular corona, its far-flung pearly-white streamers contained within sharply defined edges. Around the black limb fiery coral pink prominences added intense colour highlights to the scene. Just beyond the corona gleamed Regulus, closer to the Sun than is possible for any other star of first magnitude or brighter, while off to one side Venus shone brilliantly, far higher in the sky than its customary window of dominance in normal twilight. All too soon the right edge of the lunar silhouette brightened, then blossomed in a brilliant diamond ring that continued to intensify for a couple of glorious seconds until filters again became a must. By now the mountains to our east were in darkness as the umbral shadow receded from our immediate location, leaving a number of our small party in tears from the intensity of the experience. We woke up in the Tetons Monday morning to a sky streaked with clouds. But the hourly weather report showed clearing, so we headed to our spot before 7 AM. We were able to secure parking by our preferred observing location, the Mormon Barn with a view of the iconic Teton range in the background. Looking east, we saw the clouds slink away to the south until skies were blue and clear, despite lingering haze and smoke on the northern horizon from wildfires. Crescent Suns along with the Tetons. image credit and copyright: Kelly Kizer Whitt. Having been a science writer for two decades, I was well versed on total solar eclipses even though I’d never seen one first hand. But it didn’t unfold quite as I expected. The sky and air didn’t take on a twilight quality until the Sun was well over halfway obscured. Then when darkness fell, it came fast and the temperature dropped hard. We had on our eclipse glasses and were staring at the Sun, waiting to see bailey’s beads or the diamond ring. But first I glanced down and saw the slithering, wiggling lines of darkness and light known as the shadow bands. They have a truly creepy quality as they dance in the growing dark. Then we looked back up as the sliver of orange disappeared and the Sun winked out from our glasses. Pulling them off, my family let out cries of surprise when they saw the black hole where the Sun had been, surrounded by the long, wispy, intricate corona. The eclipsed Sun and corona took up a much larger space in the sky than I expected, but the photo I took (just like when photographing a full moon) does not give a true representation of what you can see with your eyes. I only took three photos because I wanted to just enjoy the view. I almost forgot to look for the stars. We saw a plane, Venus, and Sirius. Our eyes never adjusted enough to spot Jupiter or the others and the rosy glow of a false twilight brightened all horizons in a 360-degree ring. So soon it was over. The bailey’s beads and diamond ring we missed as the total eclipse began, and appeared to us instead at the end. These phenomena were a bright and beautiful warning to get our eclipse glasses back on. The world returned to daylight fairly quickly, but the drop in temperature lingered a bit longer. Our memories will last a lifetime. Having doubtful cloud forecasts for Scottsbluff & Carhenge, we met on a foggy morning in Sidney, Nebraska with thoughts of changing plans to Wyoming for clear skies. As the forecast improved, 15 of us set off for Carhenge. We arrived before 7 AM to plentiful parking & a few hundred people. Towards 9 AM the crowds started to swell, including aliens, welders and the governor of Nebraska. Joined by more people & dogs, I estimate around 3,000 people were at the site. Some clouds went by at mid-coverage, casting a spectacular crescent. Clouds cleared, and cheers rose as we went into totality, such a beautiful sight some were moved to tears as the diamond ring emerged. A thoroughly wonderful experience shared with friends and spellbound crowd, definitely worth the trip from Florida. I saw it (the eclipse) from Weston, Missouri, just northwest of the Kansas-Missouri line. Clouds and rain obscured the sun for most of the eclipse, but the rain subsided during totality and allowed us to get outside for the quick move into darkness. Even though we couldn’t see the eclipse or corona, the atmosphere took on a different feel. There was a change in how things were colored — as if you were looking through darker and darker polarized glasses, and the silence took on a feeling, like a deep vibration. Totality from Missouri. Image credit and copyright: Jeudy Blanco. It was amazing. We changed plans last night, instead of going to St Joseph we drove to Columbia. I was really worried the first few minutes of the eclipse because it was cloudy, my PST couldn’t resolve the image of the Sun! But quickly the clouds dispersed. We were on a property from the family of my friend, around 25 people of all ages. When it was around 70% (partial) you could feel in the environment that something was going on. Everything got a lot more quiet and the temperature dropped. Everybody was trying to get pictures of the Sun with their phones on the PST. Then totality started, it was indescribable for me. I was seeing the Sun’s corona with my bare eyes. I was really nervous and anxious, actually. We could see Venus near the Sun. Everybody was super excited, I almost cried. The experience was amazing, a total success, the long trip was worth it. Earthshine (!) on the Moon, seen during totality. Image credit and copyright: Mike Weasner. About 400 eclipse enthusiasts from around the world including me were part of a Sky and Telescope tour group. We were at Hopkinsville Community College located in Hopkinsville, Kentucky, where totality lasted 2 minutes and 40 seconds, which was too short. We arrived at the viewing site about 4.5 hours before First Contact. Traffic was surprisingly light. There were a few thin clouds but nothing significant. Anticipation was high. Many of us set up cameras and were ready well before First Contact. First Contact occurred with a clear sky, and the sky stayed mostly clear until about 30 minutes before Second Contact. Then a large cloud covered the Sun. Fortunately the cloud moved on within a couple of minutes and the sky was mostly clear through Fourth Contact. Totality was beautiful. Most people saw Venus, some saw Jupiter too, but no one seems to have seen any stars although it did get dark at the site. Many people in the group left soon after totality ended, but I and several others stayed to view and photograph the eclipse through Fourth Contact. 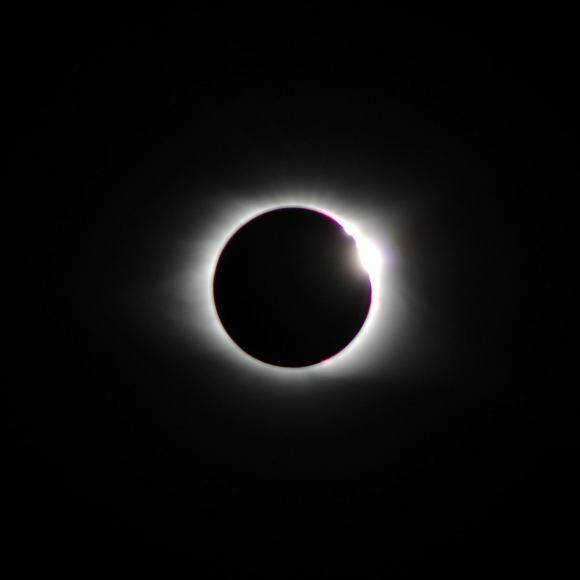 My wife and I viewed the event from Sheep Barn Ridge, which is a few miles from Kingston, TN. We began the planning in late 2015 when we realized the shadow path was adjacent to our property near my folks in TN. Our location delivered 2 minutes and 29 seconds of totality, with clear skies, a valley pasture view among new friends, goats, llama, ducks, chickens and a few hounds. We experienced every awe & oddity we had studied during the ramp up to the event. My wife did an excellent job with her photo efforts. She balanced her personal viewing time and planned equipment duties well. This was a source of much worry and discussion during the months prior. I’ll mention a few surprises. I was impressed by the amount of light cast on the landscape with barely a sliver of the Sun remaining. I suspect the ambient sunlight to the south east was the major source. The rapid transition to peak darkness was dramatic. In contrast, I noticed a clear reduction of heat radiation on my skin with about 50% coverage. It was a hot day. I wished I’d had more time to observe the animals. I found it somewhat humorous how many folks took all of the important PSA’s about retina damage to heart. Before totality they bowed their heads to the ground when they did not have their gasses on while walking, standing and sitting. What I learned most was, to the inexperienced, East Tennessee Moonshine travels faster than the Moon’s shadow. We found a lovely scenic overlook facing west in Sky Valley, just outside Dillard, Georgia. Skies were clear with only minimal cloud cover until about 13:30, when heavy cloud cover began to build in the south/southeast. The clouds obfuscated the remainder of our view of the eclipse directly. It did get much cooler, windy, and the crickets were singing just prior to and during totality. A partially eclipsed Sun versus clouds. Image credit and copyright: Jeannette Iriye. We didn’t make it to South Carolina, and had to turn the plane back because of weather. Watched instead from Saint Mary’s Georgia. Did feel the temperature drop and experienced darkening but not in totality. And us? We watched from the Pisgah Astronomical Research Institute in North Carolina as the shadow of the Moon draped over the landscape. The rolling afternoon clouds afforded only brief glimpses of the partially eclipsed Sun. Then, just prior to totality, we caught the final moments as the Sun withered to a brief diamond ring flash… and was gone. Magic! Unfortunately, the corona remained hidden behind high clouds for the 107 seconds of darkness, though we were treated to an unworldly 360 degree sunset below the cloud deck. Nocturnal mosquitoes, fooled by the false dusk, began their rounds, as a light “eclipse wind” kicked up. Author and wife (@MyschaTheriault) standing in the shadow of the Moon, plus our view from the Pisgah Astronomical Research Institute (PARI) just before totality. Thanks to @Dayveesutton for snapping the pic! Live on the wrong continent to witness the August 21st total solar eclipse? Well… celestial mechanics has a little consolation prize for Old World observers, with a partial lunar eclipse on the night of Monday into Tuesday, August 7/8th. A partial lunar eclipse occurs when the Moon just nicks the inner dark core of the Earth’s shadow, known as the umbra. This eclipse is centered on the Indian Ocean region, with the event occurring at moonrise for the United Kingdom, Europe and western Africa and moonset/sunrise for New Zealand and Japan. Western Australia, southern Asia and eastern Africa will see the entire eclipse. The penumbral phase of the eclipse begins on August 7th at 15:50 Universal Time (UT), though you probably won’t notice a slight tea colored shading on the face of the Moon until about half an hour in. The partial phases begin at 17:23 UT, when the ragged edge of the umbra becomes apparent on the southeastern limb of the Moon. The deepest partial eclipse occurs at 18:22 UT with 25% of the Moon submerged in the umbra. Partial phase lasts 116 minutes in duration, and the entire eclipse is about five hours long. The viewing prospects for the partial lunar eclipse. Credit: NASA/GSFC/Fred Espenak. This also marks the start of the second and final eclipse season for 2017. Four eclipses occur this year: a penumbral lunar eclipse and annular solar eclipse this past February, and this month’s partial lunar and total solar eclipse. Eclipses always occur in pairs, or very rarely triplets with an alternating lunar-solar pattern. This is because the tilt of the Moon’s orbit is inclined five degrees relative to the ecliptic, the plane of the Earth’s orbit around the Sun. The Moon therefore misses the 30′ wide disk of the Sun and the 80′ – 85′ wide inner shadow of the Earth on most passes. Fun fact: at the Moon’s 240,000 mile distance from the Earth, the ratio of the apparent size of the Moon and the shadow is approximately equivalent to a basketball and a hoop. When celestial bodies come into alignment, however, things can get interesting. For an eclipse to occur, the nodes – the point where the Moon’s orbit intersects the ecliptic – need to align with the position of the Moon and the Sun. There are two nodes, one descending with the Moon crossing the ecliptic from north to south, and one ascending. The time it takes for the Moon to return to the same node (27.2 days) is a draconitic month. Moreover, the nodes are moving around the Earth due to drag on the Moon’s orbit mainly by the Sun, and move all the way around the zodiac once every 18.6 years. Got all that? Let’s put it into practice with this month’s eclipses. First, the Moon crosses its descending node at 10:56 UT on August 8th, just over 16 hours after Monday’s partial eclipse. 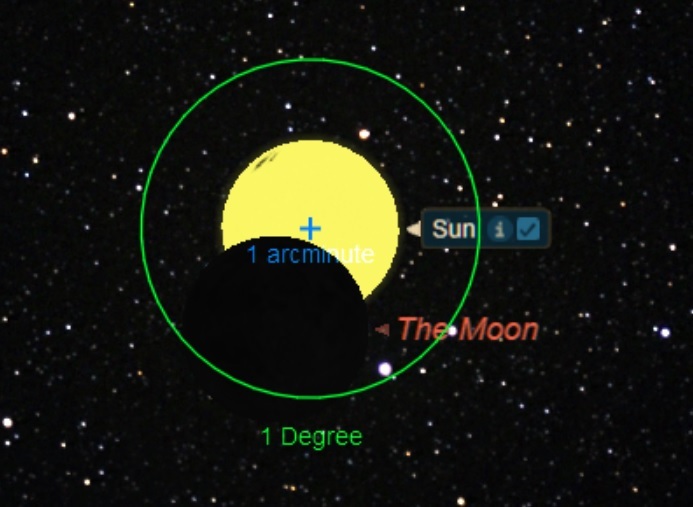 Two weeks later, however, the Moon crosses ascending node just under eight hours from the central conjunction with the Sun, and a total solar eclipse occurs. The August 7th lunar eclipse is member number 62 of the 83 lunar eclipses in saros series 119, which started on October 14th, 935 AD and will end with a final shallow penumbral eclipse on March 25th, 2396 AD. If you witnessed the lunar eclipse of July 28th, 1999, then you saw the last lunar eclipse in the same saros. Saros 119 produced its last total lunar eclipse on June 15th, 1927. The next lunar eclipse, a total occurs on January 31st, 2018, favoring the Pacific rim regions. 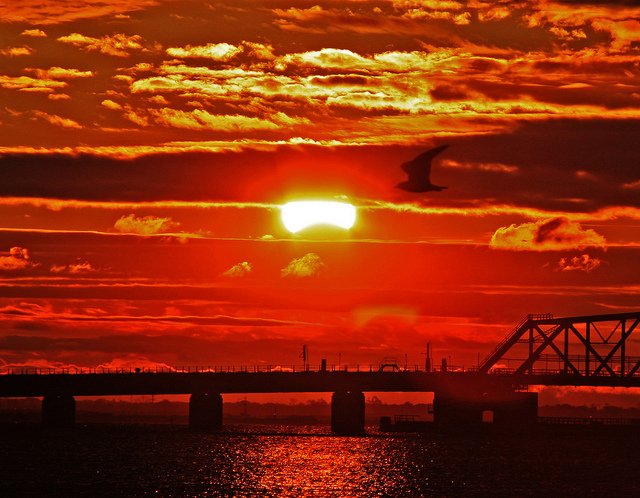 Partial lunar eclipses have occasionally work their way into history, usually as bad omens. One famous example is the partial lunar eclipse of May 22nd, 1453 which preceded the Fall of Constantinople to the Ottoman Turks by a week. Apparently, a long standing legend claimed that a lunar eclipse would be the harbinger of the fall of Byzantium, and the partially eclipsed Moon rising over the besieged city ramparts seemed to fulfill the prophecy. In our more enlightened age, we can simply enjoy Monday’s partial lunar eclipse as a fine celestial spectacle. You don’t need any special equipment to enjoy a lunar eclipse, just a view from the correct Moonward facing hemisphere of the Earth, and reasonably clear skies. See the curve of the Earth’s shadow? This is one of the very few times that you can see that the Earth is indeed round (sorry, Flat Earthers) with your own eyes. And this curve is true for observers watching the Moon on the horizon, or high overhead near the zenith. This month’s lunar eclipse occurs in the astronomical constellation of Capricornus. The Moon will also occult the +5th magnitude star 29 Capricorni for southern India, Madagascar and South Africa shortly after the eclipse. The viewing footprint for the 29 Capricorni occultation shortly after the eclipse. Credit: Occult 4.2. Finally, anyone out there planning on carrying the partial lunar eclipse live, let us know… curiously, even Slooh seems to be sitting this one out. Update: we have one possible broadcast, via Shahrin Ahmad (@shahgazer on Twitter). Updates to follow! The final eclipse season for 2017 is now underway, starting Monday night. Nothing is more certain in this Universe than death, taxes and celestial mechanics, as the path of the Moon now sends it headlong to its August 21st destiny and the Great American Total Solar Eclipse. -We’ll be posting on Universe Today once more pre-total solar eclipse one week prior, with weather predictions, solar and sunspot activity and prospects for viewing the eclipse from Earth and space and more! -Read more about this year’s eclipses in our 2017 Guide to 101 Astronomical Events. -Eclipse… science fiction? Read our original eclipse-fueled tales Exeligmos, Shadowfall, Peak Season and more!